How much lawn work is needed in New Mexico? The concept of mowing a lawn every week and certain landscaping procedures are just not exciting for me. I prefer to live in the desert over the green PNW, because of this. In fact, many people in the desert just leave their property with the patchy desert shrubs and the stuff that grows naturally. I honestly think the desert property is beautiful when people leave their desert property like that, while back East, having patchy grass and unwanted plants growing are ugly. Also, in the East, people are so strict how fancy your lawn is, while people in the deserts, seem to be more lax about if your lawn is "natural". Is it worth for me to own a house in NM with a nice amount of space between houses (semi rural), or should I live on smaller land (which would mean denser and closer to ABQ), or live in an apartment (assuming apartment complexes would be close to ABQ)? If you adjust to xeriscaping and native plants you won't have a lawn to mow. In the desert, a lawn is wasted effort and money. The wind will blow some dust and sand and grass just captures it until it is too deeply buried And dies. Plus you will need an expensive irrigation system. I have not heard a lawn mower in five years let a!one used one. I have a weed whacker to use along the fence line and I pull up tumbleweed. I do some pruning. That's about the extent of it. You do need to water anything you plant until it is established or any plants that might not be drought resistant. People often landscape with stone or pebbles if they don't want barren ground. People in the desert who insist on green lawns will be very busy or will keep it very small. You will see lawns in the older city neighborhoods. I have a little tiny (6' x 12')patch of lawn in my back yard for the dogs to chew their bones on. Bermuda does well here and is very tolerant of heat. Little pieces of dead grass all over the house in the winter are the cost. Not a big deal for me. Having a full lawn would be silly. Easier to pick up poop from crusher fine. I too use a weed eater to mow my lawn. It doesn't get buried by sand though. It's awful windy in the spring and my house certainly gets too dusty but the grass does fine in it. Can't say the same for tomato plants. They don't like it. Last edited by TKO; 01-09-2019 at 08:41 AM.. I would think your decision on whether to get an apartment or a house with a big or small yard would depend on how much privacy you want. The only lawns I've seen in Santa Fe are behind high walls; they're not visible to the public, are considered a waste of precious water, and are expensive to maintain, because of the cost of keeping them green (i.e. water bills). There are so few, that you could probably count them on the fingers of one or two hands. I've seen RE photos of Albuquerque, though, where there are entire neighborhoods of houses with lawns. I find this difficult to believe. Many people leave their backyards natural. In the front, they may landscape with desert plants, or they may cover the ground with colored stones (it helps minimize weed growth). Some people get creative, and use stones of a contrasting color or size to create a pattern of some kind. One popular arrangement is to create the illusion of a stream flowing through rocks that are the natural earth color (orange-pinkish, or beige, around here). If you adjust to xeriscaping and native plants you won't have a lawn to mow. People often landscape with stone or pebbles if they don't want barren ground. Having a full lawn would be silly. I would think your decision on whether to get an apartment or a house with a big or small yard would depend on how much privacy you want. Many people leave their backyards natural. 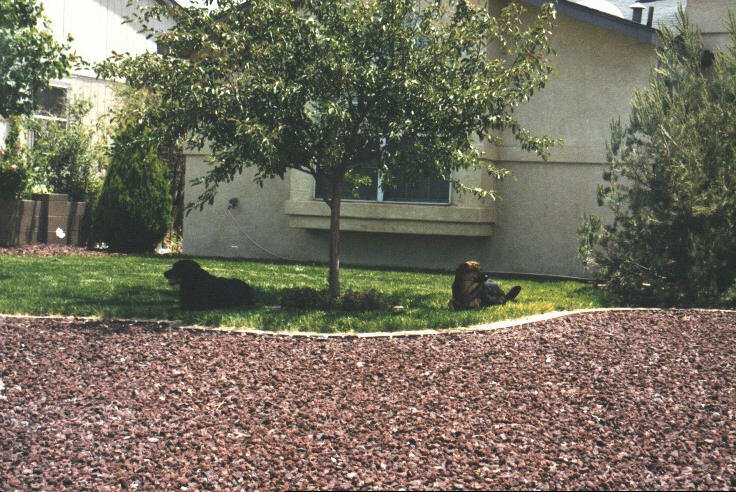 In the front, they may landscape with desert plants, or they may cover the ground with colored stones (it helps minimize weed growth). Last edited by Poncho_NM; 01-09-2019 at 08:50 AM.. Lawn? What lawn? Our rocks grow very slowly. 50184_33 by Ricardo, on Flickr. Our front yard "lawn" September, 2006. New Mexico. IMG_1293 1920w by Ricardo, on Flickr. Same front yard February, 2014, about 8 years later with no lawn..
Again, the idea of leaving the East Coast for the desert in order to avoid lawn work is pretty bizarre. I think you need some better reasons for moving. Just find an apartment in New Jersey. Obviously the amount of lawn work depends on how much lawn you have if any at all, no matter if you're on the East Coast or somewhere else. Some places in New Mexico have banned lawns because of water shortages-- I believe in Santa Fe for example zoning requires you can't have a lawn in front of your house but you can in back. Albuquerque has no such restrictions. You can have as much or as little grass as you want within city limits. In areas outside the city limits but still considered Albuquerque (like Sandia Heights) there are restrictions. And having no grass doesn't mean you have no work to do. You can be fined for letting weeds grow over 6 inches. There all all kinds of weeds that can take over a property within days. 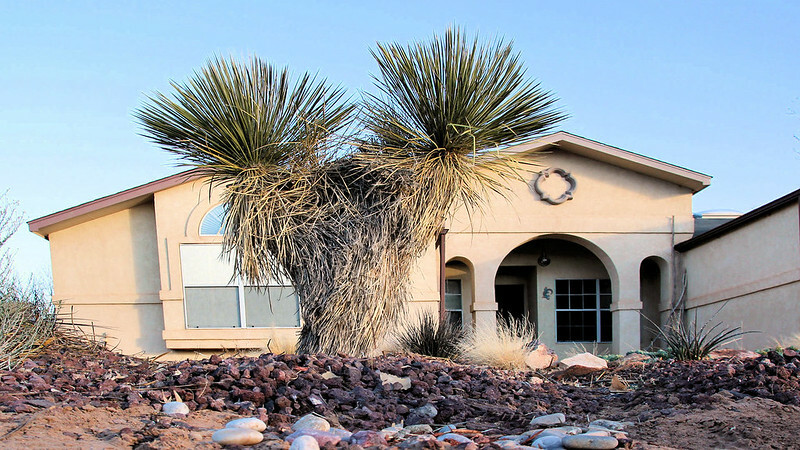 Look up desert xeriscaping. It is landscaping that uses native and drought-tolerant plants. It can be high or low maintenance depending on what you use. Then there are people who opt for "zero-scaping" which is landscaping with all gravel or no living plants. But they can still get weeds. In the East Mountains anything goes but you have to be careful about fire danger and clearing brush and trees from within a certain distance from your house. So if you were hoping to be lazy and avoid all kinds of landscape work, your best option is to find a rental or apartment where the work will be done for you. Again, the idea of leaving the East Coast for the desert in order to avoid lawn work is pretty bizarre. Bizarre? Maybe, but for me, it was either move to the desert or shoot my neighbor back in the Midwest. He was obsessed. He would cut his grass twice a week on an intersecting diagonal grid so there was always two passes over the half-acre of lawn. I swore I'd never cut grass again and didn't even want to hear a lawnmower. So far, so good.